Modor NF-1: it's digital, alright? 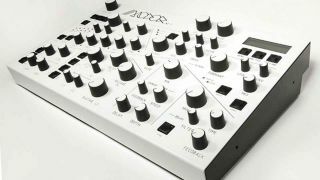 With the NF-1, Modor Music claims to have completely retooled each and every element within the standard structure of Virtual Analog synths. "We use the classic structure of VA-synths, with oscillators, filters and effects, with parameters that can be modulated using LFO's and envelopes, but every element has been retought and reinvented. In a digital way." "Yes, it's digital and we're proud of it!" Modor's statement continues, rather stridently. "We are making a very hands-on, laborious new synth having plenty of knobs and switches right on top of it to shape any sound parameter that's in it. Nothing to look up in menus!" For more info and sound samples, head over to the Modor Music site. The NF-1 is now shipping for €995.